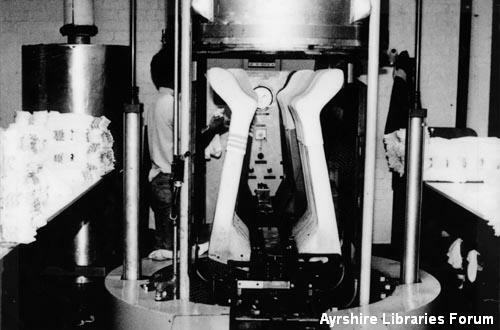 Interior photo, shows sports socks being stretched on a machine as part of the manufacture and dying process. The socks are being pressed by steam pressure on a Pegg machine. The process is called ''postboarding''. The pressed socks are placed flat on the table behind the ''postboarder'', built up in layers and then packed into large boxes or cartons ready for transportation to Shepshed,Leicester. The silver object in the centre of the screen above the socks being pressed is called the retort, it is the pressure chamber which lowers and locks then is filled with pressurised steam. The legs, called plates,were made of metal, but there were also wooden legs used on different types of pressers.